Whether you need one mailbox to mount on the front of your house or hundreds of mailboxes for a large multiunit building, you’re in the right place. 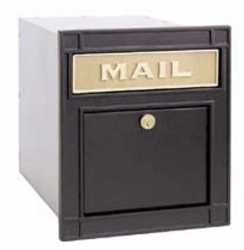 US Mail Supply carries quality, American-made mailboxes for virtually any size or type of installation. Pedestal mount, wall mount, indoor or outdoor placement, we have them all—plus drop boxes, key holders and trash receptacles. US Mail Supply is your one-stop shop for quality, American-made mailboxes at the best prices possible. We ship mailboxes throughout Wisconsin, as well as throughout the United States. 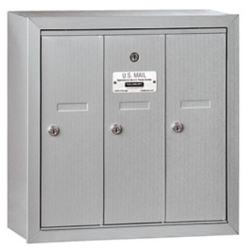 U.S. Mail Supply has a huge selection of lockable, vandal-resistant 4C mailboxes for both indoor and outdoor placement at businesses, multi-tenant buildings and institutions. Choose from contemporary styles and decorative pedestal mount mailboxes in a range of colors to complement any building’s décor. USPS approved 4C Horizontal mailboxes are the most commonly installed mailboxes for locations where mail is delivered by the postal service. 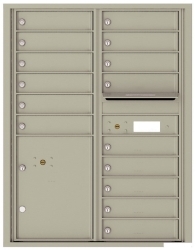 We carry 4C horizontal mailboxes for recess mounted and surface mount (mounting collar required). These are available in a variety of door configurations and 8 powder coat finishes. If you’re installing mailboxes for mail delivery by the postal service, you need to be sure you’re ordering USPS Approved mailboxes. We carry a wide range of USPS approved mailboxes, but since many of our non-approved mailboxes meet USPS standards, you can also get USPS approval on a non-USPS approved mailbox. Mailbox security has become increasingly important, so all the mailboxes we carry are built to with secure locks, heavy-gauge steel and aluminum construction, and vandal-resistant finishes. These mailboxes are built to last. 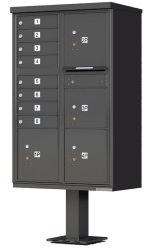 Available in 8 vandal-resistant powder coat finishes with decorative pedestal and cap options. Outdoor mailboxes in Wisconsin endure everything from summer humidity and downpours to winter snows and salt from road crews. 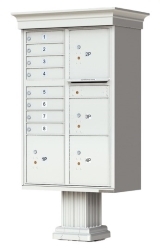 Our outdoor, pedestal mount mailboxes are built to withstand it all. Available in 8 tough, powder coat finishes and a variety of door and slot openings. Package lockers for larger deliveries also available. Indoor mailboxes don’t have to endure Wisconsin winters, but they take plenty of abuse from daily use. 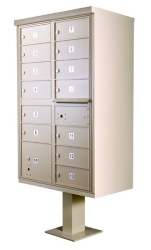 The horizontal and vertical mailboxes we carry are built to last, and can be custom ordered for the number of tenants in your building. You can also add storage lockers for outgoing or incoming packages too big for the mailbox. Homeowners and home builders are often tempted to install cheap mailboxes from the local DIY big box store, only to find they need to be replaced in a couple of years. A quality mailbox is not only a one-time purchase, it’s also provides greater security. The mailboxes we carry are all heavy-duty, American-made and built to last. 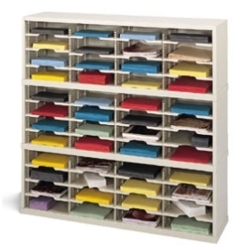 Whether you need a mail sorter for your mail room or to help keep paper stock and company literature organized, U.S. Mail Supply give you plenty of options— Open back or closed back, vertical or horizontal, even secure HIPAA compliant sorters. They’re all built from formed and welded steel and available in a neutral grey or putty finish. Mailboxes have to endure not only the wear and tear of daily use, but also attempts to break into them. For outdoor mailboxes, there’s also the ravages of humidity, rain, freeze and thaw cycles, and snow melt chemicals that get flung at them from snow throwers. Which is why it’s so important to invest in a quality mailbox. All the mailboxes we carry are built with steel and aluminum to withstand whatever abuse Mother Nature and mankind inflict upon them. With all the configuration options available, choosing the right one for your property can be a daunting task, but we’re here to help. Just give us a call and we’ll help you get it all sorted out. 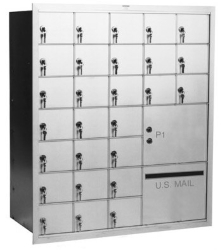 To help ensure you get just the right mailbox for your property, U.S. Mail Supply offers design assistance for custom mailbox configurations. To get started, click one of the two options listed below and enter your responses to the questions. After you submit a completed form, our designers will create a rendering of how your mailbox installation will look and provide you a quote.